Located in small town of Newry, Sunday River is one of New England's most visited and celebrated ski resorts and among the most popular in Maine. 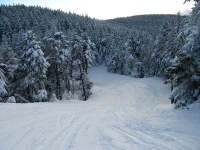 The resort is more than three miles (5km) wide with terrain suited to skiers of all abilities - in fact, few resorts in the north eastern United States can rival the unique diversity and classic New England skiing of Sunday River. Conveniently located about three hours from Boston, families travelling with kids in tow can enjoy a relatively painless journey to the resort, making it an ideal family holiday destination. Due to the wide variety of terrain, Sunday River is generally free of long queues for ski lifts (great for those with kids) and crowded slopes, making it a great place to let loose and have some fun! Sunday River features 132 trails spanning across eight interconnected mountain peaks, which are serviced by 16 lifts. The terrain is suited mostly to intermediates and beginners, particularly Baker Mountain, Aurora, Spruce and North Peaks. Advanced and expert skiers head for Oz or White Tip located at the eastern end of the resort, which features some of the resort's most challenging runs like White Heat, or Obsession. Jordon Bowl, which boasts Sunday River's most stunning scenery, is suitable for all skill levels and features some of the resort's best runs. The shopping in the nearby town of Bethel just five miles away (8 km) away is enough to meet most shopaholics' requirements. The main street is the place to go where almost 30 shops, boutiques and specialist stores line the sidewalks. Head to Wild Rose for a great variety of clothing, accessories and jewellery; Sunday River Alpacas for scarves, gloves and beanies made from warm and cosy Alpaca wool, while Mt. Mann Jewelers is the place to buy a unique gift - jewellery made from gemstones mined locally in Maine. The dining out scene in Sunday River offers plenty of variety and between the slopes and the nearby town of Bethel, holidaymakers will find everything from pizzerias and burger joints to fine dining and sushi. The on-mountain restaurants are serviced by the resort trolley system, while the access road and Bethel eateries are serviced by the Mountain Explorer shuttle, making dining out for holiday makers a joy. Head to Legends Restaurant for some good old-fashioned American fare, while Sliders offers sweeping views of the Jordan Bowl and is one of the most popular dinner eateries in the resort. Sunday River's après ski is a classic bar scene with many of the lodge bars being the local hangouts. The Foggy Goggle is the place to go for live music, good beer and delicious food after a long day on the slopes; the Barker Pub in Barker Mountain Lodge is a great local's spot where skiers can enjoy a drink on the deck overlooking the Barker and Locke Mountains; and the Shipyard Brew Haus at White Cap Lodge features entertainment throughout the entire season. Depending on the time of year one chooses to visit, Sunday River has plenty of varied activities on offer. In the winter months enjoy snowmobiling snowboarding, tubing, skiing, snowshoeing and dog sledding while the White Cap Base Lodge offers and ice rink. During the summer months, Sunday River turns into one of Maine's premier golfing destinations, and the Sunday River Golf Club has been ranked as the number one course in Maine by Golfweek magazine. Mountain biking, fishing, quad biking, white-water rafting, horseback riding, boating, whale watching, canoeing and kayaking are also popular activities for holidaymakers in the summer. Many skiers may feel that Sunday River does not live up to the standard of nearby Sugarloaf, and the abundance of families and children might not appeal to those looking for a more singles-friendly resort.